Savvy manufacturers never stop looking for ways to reduce costs while improving throughput… While the up front price of electric power tools is undoubtedly attractive, pneumatic tools offer a lower total cost of ownership and greater productivity over the long term. In this article, we explore 5 clear cut benefits provided by the use of industrial grade pneumatic grinders. 1. No Risk of Electric Shock – Grinders of all varieties are frequently used in environments where moisture, conductive materials, and flammable liquids are present. Damaged cords and wires pose a risk to operator safety resulting from electrical shock. Furthermore, metal fabricators often rely on flammable chemicals, such as acetone, to clean and prep metals prior to welding. Pools of spilled liquids can quickly be ignited by faulty electrical cords. Vapor concentrations can be higher when working in confined spaces such as those found in the mining and tank cleaning industries. In contrast, air tools use no electricity and their rotary vane air motors generate no spark. 2. Superior Ergonomics and Power to Weight Ratio – Pneumatic grinders offer a better power to weight ratio than electric grinders. Simply put, pneumatic grinders produce more horsepower in a smaller and lighter package. Misleadingly, electric tool manufacturers often classify the power of their tools by the wattage fed into the electric motors. (incidentally, as a general rule of thumb, 750 watts equals roughly 1 horse power) What’s not stated in electric tool specifications is that the power fed into the electric motor is not the same wattage that arrives to the spindle. In fact, only 50% to 60% of the rated wattage actually arrives to the abrasive mounted on the tool. Conversely, with pneumatic grinders, power in equals power out. An air tool rated for 1 horsepower will provide one horsepower of material removal power at the spindle. To further illustrate power to weight ratio, let’s compare two popular 4.5″ angle grinders: the Dewalt DWE402 and the Chicago Pneumatic CP3650-120AB45. Weight: 6.2 Lbs. Weight: 4.2 Lbs. Power To Weight Ratio: .29 HP per Lb. Power To Weight Ratio: .54 HP per Lb. 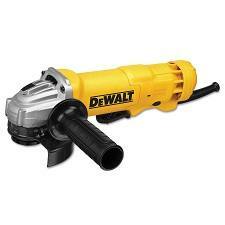 In summary, the Chicago Pneumatic Grinder offers nearly twice the horse power per pound as the Dewalt. 3. – Increased Productivity – Let’s put ergonomics and ratios aside for a moment. If increasing worker output is a priority for your operation (and when isn’t it? ), pneumatic grinders can help you meet your goals. When working with grinders of any type, Revolutions Per Minute (RPM) play a critical role in the material removal equation. Abrasive products (grinding wheels, fiber discs, flap wheels, etc.) are engineered to perform optimally at a specific RPM. Fortunately, modern pneumatic grinders are equipped with a speed control mechanism, (also know as governor), that ensures proper RPM by regulating the air flow to the tool. As the operator places downward pressure on the abrasive, the governor “opens up”, increasing air flow to the motor and ensuring the correct spindle speed. A side note on feed force – Many operators when presented with a new tool will immediately attempt to stall it by placing large amounts of downward pressure on the abrasive. They do this in an effort to test the tools power or torque limitations. Stalling out a power tool not only places undue wear on the tool, but also poses an injury risk to the operator themselves. Furthermore, this practice actually detracts rather than contributes to material removal rates. 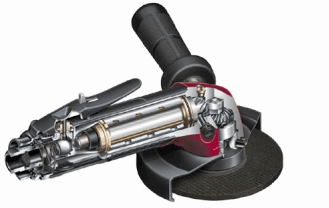 Pneumatic grinders and abrasives perform optimally when RPM limits are respected. In a non flammable working environment, you can gauge the optimal RPM by noting when the spark stream emitted by the grinder is at its brightest. 4. – 100% Duty Cycle + High Performance in Harsh Environments – Mitch Burdick, Product Manager for Concrete Tools at Bosch Tools says “The two biggest threats affecting electric tool life are debris (dust) and heat — dropping them in water, or baking them under a hot sun doesn’t help either.” By their very nature electric motors have a rated duty cycle which must be respected. Without a periodic rest, the heat generated by the motor itself will diminish performance and eventually cause premature tool failure. Furthermore, the generation of particles is inherent in any material removal process. With the open grate style motor compartments required for cooling, electric tool motors are more susceptible to the accumulation of dust and debris. In contrast, Industrial Grade Air Tools are designed specifically for use in foundries, shipyards, off-shore oil platforms, power plants, metal fabrication facilities, and petro-chemical refining plants. Air tools have a 100% duty cycle, meaning they are designed to run 24 hours a day 7 days a week (when used with a filter regulator lubricator). Air tool housings are made of aluminum or steel, not ABS plastic which makes them more resistant to the impact from repeated drops. Pneumatic grinders can even be used under water if the exhaust is vented above the surface! 5. – Ease of Servicing – An industrial grade grinder is not a disposable piece of equipment. They can be periodically rebuilt and serviced over many years. The average electric tool maintenance interval is between 60 and 120 hours afer which the tool will typically need brushes. Comparatively, a garage / maintenance grade air tool averages 200 hours between service intervals while an industrial grade air grinder can run 2000 hours between tune ups. When the time does come to service your air tools, convenient and clearly labeled kits are available that contain the most common wear parts. Bottom Line – In conclusion, regardless if you are de-burring parts in a machine shop, preparing a surface for painting, or parting gates and risers in a foundry, everyone’s goal is to get product out the door faster. With pneumatic grinders, you’ll spend less time accomplishing your task and feel safer and more comfortable doing so. Additionally, with their 100% duty cycle rating and long service intervals, you’ll spend more time working and less time servicing your tools. While the up front cost of a pneumatic grinder may be higher, it’s the total cost of ownership that matters. 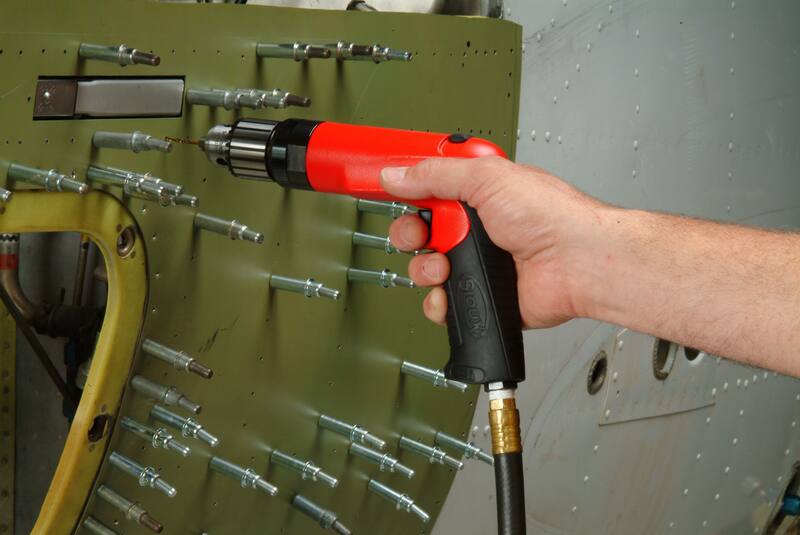 Air tools are a sound investment that results in significant gains in manufacturing productivity. Sioux Drills are known worldwide for their quality, durability, and performance. But what makes them so good and why should they be your first choice for your production line? Regardless of whether you need air drills for a local cabinet shop or a multi location aerospace operation; in this article we will explain why Sioux Drill Motors are the best value in portable hand held pneumatic drills. A History of Innovation – Sioux Tools was founded over 100 years ago with the simple goal of becoming “the best tool and machine shop.” In their early years, the company focused primarily on producing piston rings, spark plugs, and valve seating tools for the automotive market, but soon branched out into power tools after the conclusion of World World War One. Since entering the air tool business in 1958, Sioux tools has acquired over 100 patents as a result of their advances in air tool engineering and a commitment to continuous improvement. in 1994, Sioux tools was acquired by Snap On Brands, a $2 Billion S&P 500 Traded company based in Kenosha, Wisconsin. The company employs over 14,000 people worldwide. Sioux Listens – Sioux Tools places serious emphasis on end user input as evidenced by its “Signature Series” program. Signature Series is an innovative pneumatic power tool program created through the implementation of next generation ergonomics, productivity enhanced features, tool serviceability, tight tolerances, and overall value. By conducting plant level market research and using real operator input, Sioux has engineered a program that truly delivers tools for the way that end users work. In short, they design their tools around the needs of the operator. Drop in Air Motors – Sioux offers either a 0.6 or 1.0 horse power five vane air motor that delivers exceptional power and torque throughout the entire hole making process. Cylinders, rotors, and end plates are all machined from premium quality metals and feature smooth spinning, long lasting bearings throughout. Heat treating of the rotor pinion ensures long service life. More importantly, the air motors used in Sioux drills are what are referred to as “drop in”. What this means is that the entire motor can be removed and replaced with minimal tool disassembly and without the need for alignment. This allows for the maintenance department to swap out fully assembled air motors in as a little as five minutes! Furthermore, the “Slip fit” style front end plate bearing allows easy servicing of the air motor without disturbing the rotor spacing, another time saving feature. This all amounts to measurable gains in productivity, reduced downtime, and easy tear down and rebuild. Simple Gear Box – Sioux drills feature a simple 3 piece planetary gear system. Fewer and larger gears means bigger teeth, better power transmission, less stripping, and greater performance under load. The gears are fitted with slip pins and the ring gear is machined into the motor retainer for easy assembly and disassembly. An easily accessed Zerk fitting on the top of the tool’s outer housing makes greasing the gear reduction a snap. Lastly, the entire gear train can be accessed and removed without removing the drill chuck. Interchangeability – Sioux signature series drills share many common parts. Cylinders, rotors, end plates, and bearing are interchangeable among many models of their drills and pneumatic screwdrivers. This means fewer parts to stock in the tool room, fewer SKU’s to manage, and a decreased inventory holding cost. Better Ergonomics – Sioux pneumatic drills are anatomically designed to keep the operator’s hands and wrist straight during use. The insulated handle protects workers from cold transfer while the built in finger rest encourages proper grip. On models with reverse, the shuttle reverse switch is easily accessible without stretching. Sioux uses a lightweight aluminum housing covered with a rubber grip to keep total tool weight to a minimum while reducing vibration. Innovation – Sioux drills offer many features designed with restricted work space access in mind. Z Handle Drills – With an overall depth of only 3-1/2 inches,Sioux’s unique Z handle drills allows operators to drill true holes in tight spaces. Excellent for use in aerospace and truck body, these high quality drills are not only handy, but durable as well. T Handle Drills – Sioux Extended Length T-handle drills reduce stress on the operators back and arms while making quick work of any decking application. Activation is controlled by a lever type throttle which further promotes proper ergonomics. Aerospace Drills – Commonly used in aircraft construction and maintenance, Sioux compact head drills are available with 45 and 90 degree angle heads. The chucks on these drills are typically female and are designed to be used with threaded 1/4-20 drill bits that screw right into the head of the tool. American Made – Sioux production drills are produced at the Snap On Murphy plant, a 168,000 square foot manufacturing facility nestled in the Appalachian Mountains. The plant employs approximately 230 employees and subscribes to the principles of lean manufacturing with an almost religious zeal. Visual cues abound and the use of kan ban and Andon systems eliminates stock outs resulting in shorter production lead times. 40 plus machining centers churn out high quality tool components which are subsequently assembled in house. Bench marking, training, linking, and optimization are used to ensure that the facility meets the goal of “rapid continuous improvements” or RCI. Conclusion and Bottom Line – By combining 100 years of American ingenuity with the proven principles of Japanese lean manufacturing, Sioux develops world class production grade drills right here in the United States. Sioux drills hold a tolerance of up to +/- .005, are competitively priced, and are supported by an extensive work of authorized distributors and repair centers worldwide. Performance, serviceability, ergonomics and value, it all ads up to the best production class drills on the market. At International Air Tool Company we’re big proponents of the only cry once philosophy. What we mean by this is we believe in buying quality the first time around rather than throwing bad money after good. I understand it stings to shovel out $400 of your hard earned money for an industrial grade air tool, but if properly cared for that tool will last you 5, 10, or even 20 years. In fact, we frequently receive tune up kit inquiries for air tools that were manufactured in the eighties! Additionally, a good quality tool will pay dividends in productivity, allowing you to complete the job faster and with better results. What worries us is when we receive a call from someone claiming that their industrial grade air tool lasted no longer than their last Harbor Freight model. This instantly raises a red flag as to the quality of air being supplied to the tool. Regardless of purchase price, any pneumatic tool being fed a steady diet of dirt, rust, and contaminated water will surely suffer a premature fate. In this article, we will discuss the number one way to maximize the life of your air tools, through the use of an FRL or filter, regulator lubricator combo. Just as the name implies, an FRL is a three piece combination unit comprised of an air filter, pressure regulator, and inline oiler also known as a lubricator. These units should be installed as close to the point of use as possible and ideally should be populated one FRL per work cell. Diluting the beneficial properties of an FRL amongst too many air tools will decrease the FRL’s effectiveness. Filter: Compressed air filters are the first line of defense as the air arrives at the FRL station. These filters are designed to remove airborne solid and liquid contaminants. They can be ordered with different type filter elements, including the coalescing style, which can remove particles as small as 0.3 microns. Off the shelf however, most FRL filters are equipped with a 5 micron element which still provides adequate filtration for most industrial environments. FRL air filters are offered in either manual drain or automatic drain versions. With manual drain filters, the unit is equipped with a small relieving valve on the underside of the catch bowl which must be opened periodically to release captured water and contaminants. If the water is not removed and the bowl fills to capacity, the incoming air will not be filtered, bypassing the unit entirely. Conversely, automatic drain units let off a constant slow drip of moisture and debris caught by the filter. Some maintenance professionals will connect a small clear tube to the units drain outlet in order to redirect the dirty water into a small bucket or other container. This prevents personnel from slipping in the relieved condensation. Regulator: Almost all air tools, regardless of size, are designed to be ran at 90 PSI. Under pressurized tools won’t run to spec and tools that are over pressurized will wear prematurely. Inline air regulators provide a convenient way to keep an eye on pressure. They provide controlled, consistent air pressure required for specific applications. Air pressure regulators are standard equipped with a dial gauge that ranges from 0 to 140 PSI. However, different spring ranges are offered to suit different requirements. Standard air regulators are of the relieving variety, meaning that unneeded pressure is bled off before it reaches the next step in the FRL trio which is the lubricator. When setting the pressure of your regulator, make sure you do so with the tool at the end of the line running at full throttle. You want the dial to read 90 PSI when the tool is wide open. Lubricator: Mist type lubricators ensure that your pneumatic tools receive the lubrication required for peak performance. 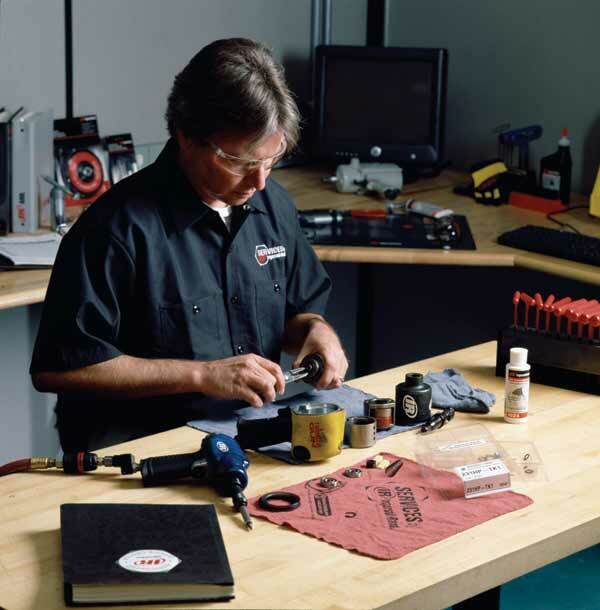 Proper air tool lubrication is essential for decreased wear and maximum tool life. Inline air lubricators are designed to provide the correct amount of oil required my emitting a fine mist of oil into the air line. While a small amount of the mist travels in atomized form directly to the air motor of your tool, much of it accumulates along in the inside walls of your air hose. As the oil accumulates it forms small beads which subsequently drop into the air stream. Therefore, in order to avoid oily work pieces, it is a good idea to limit the amount of oil released from your lubricator. Most lubricators are equipped with a site glass to regulate the flow of oil. You can monitor the frequency of drops passing through the site glass by using a stopwatch or other timer. Smaller air tools up to around 25 CFM only require a drop or two per minute. However, as the CFM of the tool increases it is a good idea to increase the ratio accordingly. Excess oil in the exhaust air is a sign of over lubrication. While this most likely won’t do your tool any harm, it will waste money and create a dirty work environment. Regarding the air tool oil itself, while they are many brands of air tool oil out there; we have had good luck with the Ingersoll Rand and Marvel Mystery Oil brands of air tool oil. However, truthfully any non-detergent 10 weight motor oil will work just fine. Keep in mind that no matter how well you care for your tools, anything mechanical will eventually need maintenance. In our next segment we will go through the step by step process of installing a basic air motor tune up kit on a standard rotary vane air tool. 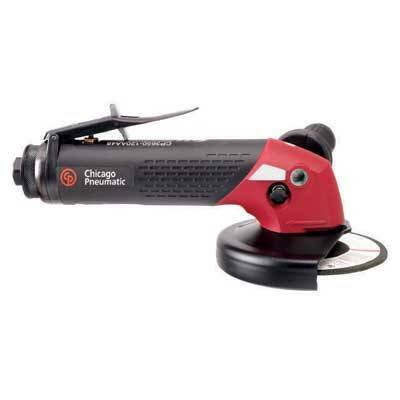 Revamped Line of Chicago Pneumatic Impact Wrenches Offers Tools for Every Application, Fills Gap in The Market. Throughout the course of our daily operations, we often receive calls from customers asking which is the best “brand” of air tool. This is almost always a loaded question and rather than engage them in the Ford versus Chevy debate, a little further questioning usually reveals dissatisfaction with the performance of one of their tools. While in almost all cases an industrial production grade air tool is going to provide better performance than an automotive / maintenance style tool, there are some sure fire ways to ensure optimal performance regardless of the quality of the tool selected. In this article we will focus on the two most important factors in air tool performance, these being pressure and flow. Proper Air Pressure (PSI) – The vast majority of air tools on the market are designed to run on 90 pounds per square inch of pressure, commonly known as PSI. The misconception is that a 2-1/2″ drive impact wrench requires more air pressure than a small right angle die grinder. The reality is that both of these tools are designed to run optimally on the industry standard 90 PSI. Exceeding the manufacturers recommended air pressure can actually damage components, shortening tool life and creating a potentially dangerous situation by compromising the burr, wheel, or other accessory in use. Furthermore, you want to be sure that you are getting 90 PSI of pressure when the air tool (or tools if working with multiple stations) is running. Use an air regulator to gauge the pressure while the tool is wide open. If the needle reads 90 PSI when the throttle of the tool is closed but dips below that when the tool is engaged you need more pressure. Again, most air tools are designed to run at 90 PSI and will underperform if under pressurized. Air Flow (CFM) – What varies widely from tool to tool is the required air flow rate which is measured in cubic feet per minute (CFM). Before selecting an air tool for any application be sure that your air compressor can generate the necessary CFM. As a very generalized rule of thumb you can conclude that for every one horse power that your compressor puts out, you will receive 3 to 4 CFM. To put it in perspective a small right angle die grinder uses about 25 CFM while a 1″ impact wrench requires 60 CFM. In addition to verifying that your compressor has the guts to power the tool on hand, make sure you aren’t starving the tool by restricting air flow through the use of a small diameter air hose. Never use reducers to adapt a 3/8″ NPT or 1/2″ NPT to a 1/4″ air line. In fact, if you can avoid it try not using 1/4″ air lines at all. Free unrestricted air flow is paramount to maximizing air tool performance and it’s better to error on the side of too large a hose rather than choke the tool. Nothing will sabotage your project faster than an underpowered tool and lack of flow is definitely a deal breaker. In the next installment of this five part series we will look at why every air tool deserves to be paired with a good filter, regulator, lubricator. The two firms have agreed to strategically approach metalworking markets that will most greatly benefit from the innovative Fein offering. These include customers in the ship building, turbine engine fabrication, and aersopace industries. As part of the go to market strategy, Fein and International Air Tool will offer customers in Southern California the opportunity to receive free on site products demonstration performed from Feins mobile show room vans. These demonstrations will allow customers the opportunity to test the tools before they commit to a purchase. Emil Fein invented the first electric hand drill in Germany in 1895. With this invention, he laid the foundation for the highly reliable power tools that FEIN continues to manufacture in Germany and for which this tradition-rich company is respected in trade and industry throughout the world. FEIN has been among the world’s leading power tool manufacturers for over 140 years. And that is also undoubtedly because, with every new product innovation, FEIN continues to pay attention to its commitment to only develop durable power tools of the highest quality. International Air Tool & Industrial Supply Company is a San Diego, CA based distributor & exporter of pneumatic & electric tools, diaphragm pumps, hoists and related accessories. We carry only the finest quality, brand name tools and pride ourselves on our technical expertise and excellent customer service. We are a family run operation that effectively serves customers regionally, nationally, and abroad. Air tool manufacturers typically divide their wares into two distinct levels of quality. These being automotive / maintenance grade on the lower end, and industrial production grade on the higher end. Automotive tools are built for occasional use and are hence better suited for maintenance or vehicle service type work. Industrial grade tools in contrast, are designed for continuous; day in and day out use in production environments. What differentiates these two grades of tools is the quality of components used during assembly. Automotive tools feature standard duty, cast components that are typically not heat treated during production. Additionally, metals utilized may not be of the finest purity. Industrial grade air tools on the other hand feature heat treated, machined components made from high grade steels, aircraft aluminums and high tech composites. According to Schieber, “Different applications warrant different grade tools, and there are definitely markets for both automotive and industrial grade air tools”. For shop and garage use, automotive / maintenance grade tools are usually fine. However, in staying true to our commitment to continuous improvement and sustainability, we want to make sure that our clients aren’t burning through 10 automotive tools per month through misapplication. If this is the case, then a simple ROI analysis usually provides justification for an upgrade.” After investing in a production grade tool, that tool can be rebuilt many times over; usually for the nominal cost of a tune up kit. In addition to Ingersoll Rand Air Tools, International Air Tool Co. offers environmentally friendly diaphragm pumps and industrial grade hoists designed with user safety in mind. ARO Diaphragm Pumps feature bolted construction which stops chemical leakage onto the surrounding area. Ingersoll Rand Hoists feature overload protection which prevents loads from slipping and falling during lifting. Both are examples of the firm’s enduring commitment to sustainability, user safety, and choosing the right tools for the job. For additional information on International Air Tool Company or for help qualifying an application, please visit http://www.intlairtool.com or call (800) 608-5210.
International Air Tool & Industrial Supply Company is a San Diego, CA based distributor & exporter of pneumatic tools, diaphragm pumps, hoists and related accessories. The firm carries carry only the finest quality brand name tools and prides itself on its technical expertise and excellent customer service. I.A.T’s mission is to help industrial customers to increase productivity, lower costs, and improve user safety related to the use and care of pneumatic tools. International Air Tool & Industrial Supply Company Create a free website or blog at WordPress.com.